The German state of Bavaria has abandoned plans to reprint Mein Kampf after its legal power to ban Adolf Hitler's manifesto expires in 2015. In a surprise move, the state government cancelled a planned annotated edition of the book out of respect for victims of the Holocaust. 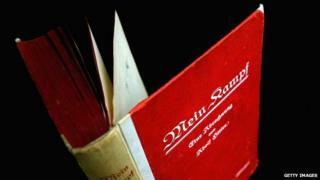 Bavaria holds the rights to the book, written by Hitler in a Munich prison. The state blocked republication for decades but was considering an academic edition to "demystify" the text. It has now vowed to continue banning the book even when copyright expires. However, Munich's Institute of Contemporary History (IfZ) said it had no plans to scrap the project, which has cost 500,000 euros (£419,000; $688,000) to date in state funding. In a statement on its website, the head of the institute, Professor Andreas Wirsching, said it intended to publish its edition independently after the copyright expired. Critics point out that the text has long been available on the internet and in other countries. However, after complaints from Holocaust survivors, the state government decided this week to keep the "seditious" book off the market. It warned that any publishers who printed it would face criminal charges. "Many conversations with Holocaust victims and their families have shown us that any sort of reprint of the disgraceful writings would cause enormous pain," said Bavarian Science Minister Ludwig Spaenle on Wednesday. The former head of the Central Council of Jews in Germany, Charlotte Knobloch, said she backed efforts to stop any reprints of a book "steeped in hatred and contempt for humanity". It was, she said, "one of the most inflammatory works ever written in this country". The Bavarian state government commissioned the book from the IfZ two years ago. In his statement, Prof Wirsching argued that a study of Mein Kampf was essential to understanding the Nazi period and the IfZ's planned edition would help educate people as well as demystifying the book. The institute, he said, would publish in 2015 "under its own responsibility", as an independent research organisation. Published in 1924, Mein Kampf (My Struggle) rails against Judaism and communism. Copies were presented as gifts to all newlyweds in Nazi Germany.